Join us in the galleries for a thirty minute conversation with Stephan Hassam, PhD candidate at the University of South Florida, about ancient glass. Thirty on Thursday gallery talks are free with regular admission. Questions? Email the Education Department. Glassware is an integral part of everyday life in modern times. Glass, however, is no modern invention and has a long history of production and use in the ancient Mediterranean. 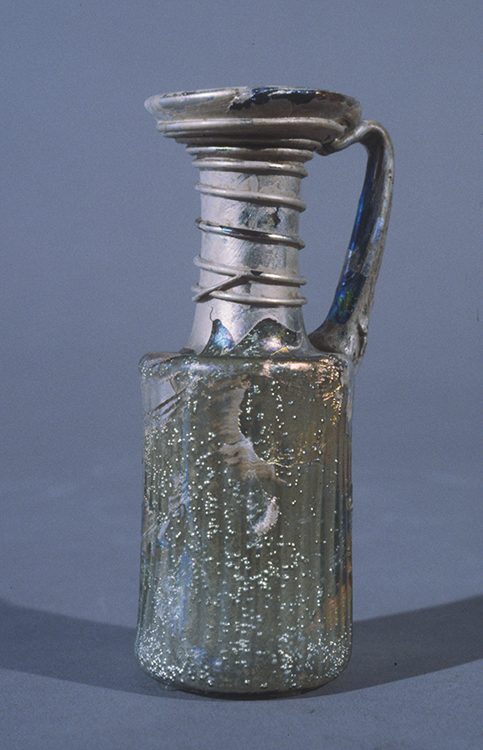 Glass objects were an important part of everyday life in ancient Greece and Rome, as well as many cultures before and after. Glass has long been appreciated for the technical skill of Roman glassblowers and glasscutters, but the context in which ancient glassware is found tells us even more about the people and the societies that used them. Using objects from the Tampa Museum of Art’s current installation of ancient Roman glass, this lecture will provide a window into the use of glass in antiquity. From storage to trade, from technology to ritual, glassware can answer many archaeological questions. This presentation will touch upon some recent research on ancient glassware and the techniques archaeologists use to answer questions about the ubiquitous but fragile material.